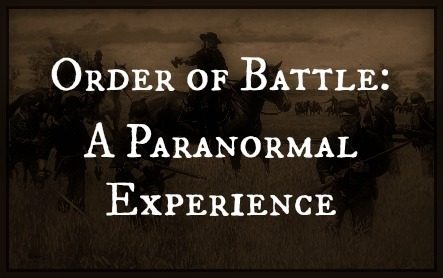 Most people who are sensitive to spirit energy will agree that the Gettysburg battlefield and surrounding area is probably the most active locale for paranormal phenomena in the United States, if not the world. It seems that people have seen or heard something out of the ordinary at every engagement spot on the battlefield. 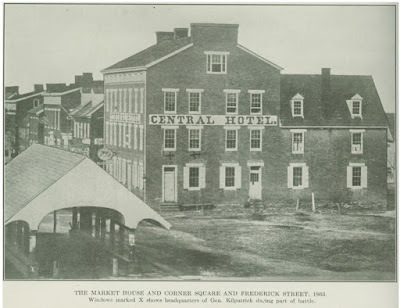 I have also investigated phenomena in other battle areas including Lee’s retreat back through Maryland and into Virginia after the Gettysburg engagement. I was born and raised in Hanover, Pennsylvania, (13 miles east of Gettysburg) so my knowledge of the Battle of Gettysburg came early in my childhood. I became interested in the history leading up to this decisive clash between north and south. Of course, at that time I was mostly limited to reading and making inquiries...but my spiritual abilities had been gradually developing since an early age, to the point where I was recognizing different vibrations and energies. In June 1998, I decided to take a few weeks to get up close and personal with the history of the Battle of Hanover...an important prelude to the Battle of Gettysburg. Most of my investigation concentrated on the exact order of the battle that day of June 30, 1865. Though most of the buildings and locations are no longer there, it was surprising how the official report written after the battle corresponded with some of the landmarks that remain. One evening, I found myself north of Hanover near the area of the old Hanover airport and beyond. I was walking around trying to get a feel for landmarks. Broadway (formerly the Abbottstown Pike) leads from the Hanover square, north into the Pigeon Hills. Near this point I started to get a residual sense of horses and chaos. Nothing was very clear but I could tell that the tack was that of Union cavalry. It felt like an engagement was near. I was able to pick up just bits and pieces of weak spiritual activity. I decided to drive back into town, stopping several times in hope of sensing energy. I wasn’t recognizing anything other than the strange looks I was getting from people sitting on their porches. In fact, one man recognized me and started a conversation. I told him what I was doing and got a glance that I was now familiar with...that I must be nuts. Anyway, I told him it was nice to see him again and continued my trek south on Broadway. At this point, I was getting close to my Grandmother’s residence. Her house was built in 1903 (by my Great Grandfather) but some of the wood structure from the original building was incorporated into the newer structure. She was at a friend's house visiting, so I decided to sit out by the old pine trees on the north side of the house. My grandmother has always been an inspiration to my love of local history. 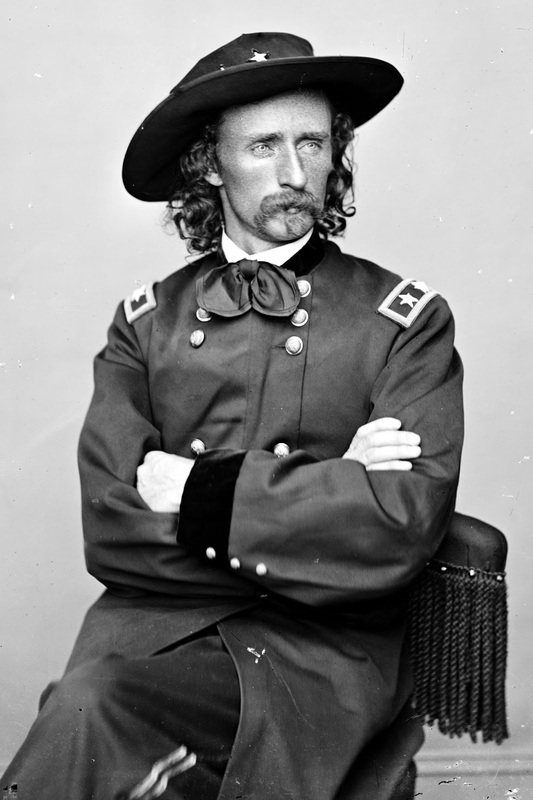 For as long as I could remember, she swore that Brigadier General George Armstrong Custer had dismounted his horse and sat on a bench in front of the original building (at the time, it was a store) and held a brief consultation with his officers after he and his Michigan cavalry counterattacked Major General J.E.B. Stuart’s invading forces and had forced them out of town. I had always considered this story as a tale that embellished itself over the years. I did know that this was near the point where Custer’s fighters crashed into Stuart’s forces during the counterattack but most of the heavy fighting occurred closer to the town square...so, that’s what I thought. By this time, it was starting to get dark and there was minimal traffic on the street. It was the weekend and Hanover was still the stereotypical “small town” that rolls up the sidewalks at night, especially in the residential areas. The weather was calm and warm. I sat there for about an hour or so thinking about my activities for the following day. In fact, I'm sure I dozed off for a bit...when I noticed the muffled sound of horses. Soon, I was hearing “pops” and I swore I could smell sulfur from burnt gunpowder. I attempted to get a spiritual ‘picture’ (or astral state) and was sensing someone who was frantically trying to find something. I continued to sit and concentrate when “bam!”...an immense flash to my right. I instantly felt the concussion and burning. It literally blasted me off the lawn chair. I hit my head against the pine tree trunk (because that nasty sticking pine sap was all over the side of my face). I got up and wiped the debris off. Just as fast as it had started, the action had ended. This was very strange...that I felt physical contact while in an astral state. As well, this event had associated echoes which, in my experience, are rare in combination with other paranormal activity. Instead of residual spirit energy, this was more of an astral perception of the actual event. Anyway, I decided that was enough for one night. In 1984 I was at St. David's Cathedral in Wales. Founded around 590 or so, a new cathedral was built around 1131 or so, when it was declared to be one of the most important pilgrimage sites. It was said that 2 pilgrimages to St. David's was equal to 1 of Rome. In 1171, no long after a visit by Henry II, the current cathedral was begun. Evidently, at one time, there was a special pilgrimage of those embarking on the crusades. Henry and Eleanor were both present. I sat in the ancient building, and swore I could, i my mind, see the processional. It was the strangest feeling. I walked back up the hill to the car park and stood at the wall around the cathedral. I could see the entire processional walking into the building. A few weeks later, I literally made a pilgrimage to Fontevraud Abbey, to visit the final resting place of both Henry, Eleanor and my favorite royal, Richard Coeur de Lion. I took a number of photos - slides. When I was finally home, and they were developed, the owner of the camera shop, where I would have them developed, had pulled three slides from that roll of film. I must have taken a dozen shots. Three of them had this long, green light - I swear it looked like a lightsaber, pointed over Richard's sarcophagus. My friend, who was an expert at developing, went back and went through the entire roll. He checked the angle of the shots - they were all the same - I was using an auto drive on the SLR. He said the only logical conclusion was the shot had something to do with Richard. I told him about the cathedral, and how I was feeling about where Richard was interred. I was very upset about it. There he was, the most illustrious king in England's history, and no one even cared. Evidently he realized I cared about his final resting place and responded - somehow. I swear we experience time-slips. There have been 2 other occasions, 2 other experiences. I have a friend who is a 79 year-old nun from New Orleans. She told me she was walking through one of the older parts of town, and could tell someone was following her. A woman in a hoop skirt hurried past her, nodding. She watched her for about a block, then the woman disappeared.